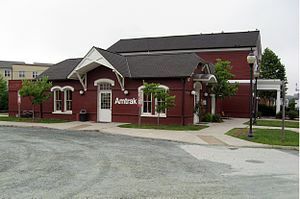 The Charlottesville Union Station, located in Charlottesville, Virginia, United States, is served by Amtrak's Cardinal, Crescent, and daily Northeast Regional passenger trains. It is Amtrak's third-busiest station in Virginia, aside from its all-auto Auto Train station in Lorton. The station is situated in the northeast quadrant of the junction between two railway lines. The Cardinal uses the east-west line, owned by CSX Transportation and contracted by the Buckingham Branch Railroad, while other services use the north-south line that owned and operated by Norfolk Southern Railway. The station is within walking distance of the University of Virginia, which is the major employer in the area. The original Union Station was built in 1885 to jointly serve the Charlottesville and Rapidan Railroad, the Virginia Midland Railway, and the Chesapeake and Ohio Railway. Major renovations in 1915 included the construction of a baggage handling facility. When Amtrak took over most intercity passenger rail service in 1971, the Southern Railway opted to continue running the Southern Crescent itself. The Southern Crescent continued to use Union Station, while the James Whitcomb Riley (later the Cardinal) used Main Street Station to the east. Afflicted with rising costs, the Southern Railway relented and turned the Southern Crescent over to Amtrak on February 1, 1979. Amtrak renamed it as the Crescent and made Union Station the Charlottesville stop for the Cardinal as well. For most of the next three decades, the only trains calling at Charlottesville were the Crescent, which arrived northbound during the morning rush and southbound in the evening, and the tri-weekly Cardinal, which arrived westbound at lunchtime and eastbound before the afternoon rush. In 2009, Amtrak extended a Northeast Regional round-trip to Lynchburg (since extended to Roanoke) by way of Charlottesville. Since 1999, the former baggage handling facility is home to the Amtrak ticket office and waiting area. The main facility has been privately developed into the commercial restaurant, Wild Wing Cafe. Plans coincident with the redevelopment to create a transportation hub at Union Station were not realized. Instead, in 2007 Charlottesville completed the Downtown Transit Center one mile across town. However, the station does serve as an intermodal transportation nexus, with connecting Thruway motorcoach service to Richmond (operated by James River Transportation) on site, a 200-plus-space parking lot, and access to a full-service Greyhound Lines bus station down the street. Such services allow Charlottesville travelers to reach various airports in the region. The Charlottesville Free Trolley stops just north of the station, and connects Downtown and the University of Virginia. Out of the twenty Virginia stations, Charlottesville is the fourth busiest in the state according to the FY2016 ridership. This is mainly due to the large number of passengers traveling between this station and Washington, Baltimore and points north. ^ "Amtrak Fact Sheet, FY2017, Commonwealth of Virginia" (PDF). Amtrak Government Affairs. November 2017. Retrieved 29 December 2017. ^ a b "Amtrak Fact Sheet, Fiscal Year 2016, Commonwealth of Virginia" (PDF). Amtrak. 2016. ^ Nagasaki, Hikki. "Charlottesville, Virginia". USA Rail Guide. TrainWeb. Retrieved 11 July 2016. ^ Charlottesville Tomorrow, Transportation Matrix Archived November 1, 2007, at the Wayback Machine. Retrieved November 2, 2007. ^ Hawes Spencer (2007-06-22). "Riding the rails: It's the only way to fly". The Hook. Charlottesville. Retrieved 2011-06-30. ^ "Amtrak Virginia announces new Northeast Regional service". Wikimedia Commons has media related to Charlottesville Union Station.